These are all kid tested, mother approved at this house. 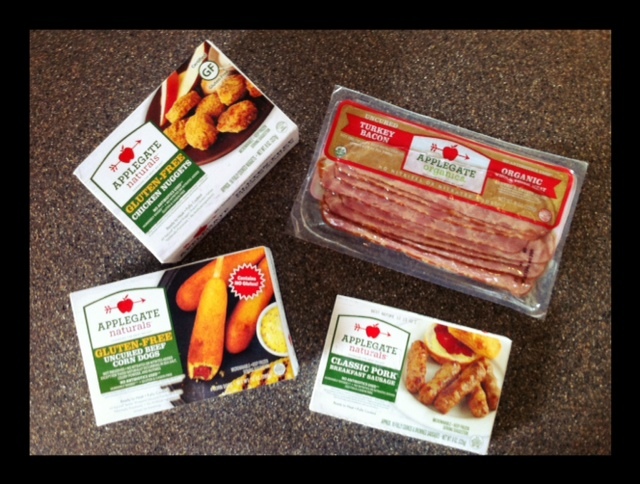 Yummy gluten-free and casein free meats from Applegate Farms! Yum! When we go to the doctor, they have a file on us… our records are kept safe and sound. Technology as it is, one might assume you could find your records anywhere – at any time, from anywhere, since most are computerized. I believe the time span is 6 years, for a doctor to keep your records on hand… and then, they can legally dispose of them. I never knew that! This is important information to know. When I moved from Iowa to Kansas in1998, I only had a few medical records that came with me. I was able to get a few of my records sent from when I was born to age 5, but then we switched doctors… and we switched a few more times, until all I have is from when I was 5, to just a few records from a specialist when I was 15, 17 and 19. So, basically 10 years were missing. Your records are important to have for a few reasons. Mainly for your own safe keeping, but in the event that your doctor unexpectantly moves, like ours did… it’s nice to have copies, and records. Another important reason is so that you can double check, and see exactly what was said. Case in point, my upper and lower GI procedure, and the lack of biopsies taken. I also discovered that I had “prominent lymphoid aggregates” in my colon… and no one mentioned that. That is a sign of chronic inflammation and the body attempting to repair itself. Chronic inflammation – leads to colon cancer, and some people never feel a thing. Surely, given my history and desire to be tested for celiac, this is an indicator that I had been having issues. This was also the reason why the gastrologist suggested I start taking IBS medicine when I was having problems. He mentioned this while I was still under the influence of whatever it was they gave me, and I shook my head several times – I was NOT going to go the medicine route – to try and mask what was going on. All I heard was “medicine”… and my head started shaking. Now don’t get me wrong, I’m not against medicine – I just don’t think it should be used to mask symptoms that can be treated nutritionally. It seems to me, any doctor that specializes in the stomach and colon, or celiac – would clearly see and understand the issue of gluten sensitivity and celiac for our family… we just happen to live in the mid-west, in a rural area… and that isn’t the case here. Daily I see the battle that many have had for years – seeking answers, and giving up… and I shake my head thinking – WHY do they wonder why only 1% of celiac patients have been diagnosed?? This shouldn’t be so hard? The diagnostic process can be a nightmare of sorts – and it’s easy to give up at a certain point. If I didn’t have 8 children with a future – I’d be fine with dropping it. I know what is going on, it’s gluten sensitivity for some, and celiac for others – that’s enough for me… But I also realize how many other people I know – are out there suffering, who need help too. They don’t know where to turn… and I’ve read enough to make my head explode. Most people start reading how difficult this testing process can be, and give up… and then, there are those extra blessed people, who’s doctors totally get it right away… and they get their answers quickly, and easily. Apparently THOSE are the 1% that are “properly” diagnosed. For the rest of us seeking answer – keep all of your records together. You never know when you might need to connect the dots! My husband is a filing guru. He sets up files for files… I’m not kidding, he loves to file, and I’m grateful! Thankfully he is great about keeping their records in order so when they move out on their own, they’ll have a copy of their records to take with them! Posted on August 8, 2012, in Celiac/Gluten Sensitivity, Our Struggles, Truth and tagged Applegate farms, celiac disease, celiac testing, gluten sensitivity, healthy for him, keeping Medical records. Bookmark the permalink. Leave a comment.